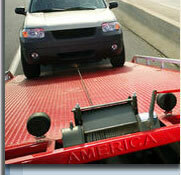 America Towing Corp. is a junk vehicle removal service proudly serving Miami Dade, Broward and Palm Beach Counties. How do I start the vehicle removal process? Do I pay America Towing Corp. for removing my junk car? How long will it take for my vehicle to be picked up? Do I need a title in order to have my vehicle towed away? What area does America Towing services? Do I receive top money for my junk car? The vehicle that I have is not mine and is abandoned on my property, what do I do? If the car is in a different location than I am, can you still remove it? Will I receive a receipt once the vehicle has been removed? Do I need to be present when the junk car is removed? Can I junk my car even if I have unpaid parking tickets? My car was involved in an accident. Do you still buy it? Is there any expense for selling my car, like towing charges? How do I start the vehicle removal process? even using! Simple. You can either fill our online form or call us at (305) 305-8403 or (954) 274 0752. America Towing Corp. is a junk vehicle removal service. We do not charge for removing your junk car, we Pay You!!! Not. Top Dollar Paid. Usually same day within 2 hours, or you can schedule a pickup date/time at your convenience. Do I need a title in order to have my vehicle sold as junk? If your vehicle is over 10 years old you don't need a title, for newer's vehicles you must have original title. We are proudly serving Miami Dade, Broward and Palm Beach Counties. Yes. We provide very fair and honest quotes. If you feel your provided quote was not fair then e-mail/call Us and let Us know what would make you happy. Unfortunately we can't help, you should call the local tow away company and let them take care of it. Yes. Please make sure to advise us of this detail when you submit our online form or call us. Yes. You will get a receipt and bill of sale. In most cases, you will have to be present when your vehicle is removed, but if you can't we can work it out. Yes, your parking tickets will not prevent you from sell your car. Yes, we buy cars any type, year or condition. No, we provide free towing, free paperwork, free quotes, you just get Cash!